I grew up in the south where it was very much acceptable to have fried okra as a vegetable 4 times a week during the summer. My parents and both sets of grandparents grew okra in their gardens. I wasn’t a fan. And I couldn’t get away from it. Like most things that weren’t macaroni & cheese, I had to slowly come around to appreciate okra. But only fried. And even then, only dipped in ranch dressing. With containers of okra sitting in the produce section for $2 ($2! ), I couldn’t pass them up. 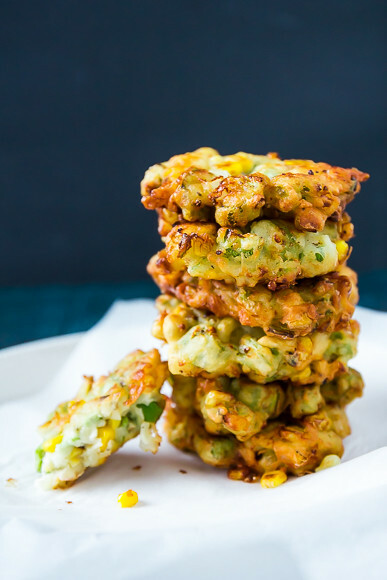 Instead of plain okra fritters, we threw in the kernels from a leftover grilled corn cob (we always throw a few extra cobs on the grill just for occasions like these!) and some goat cheese. Because everything’s better with goat cheese! 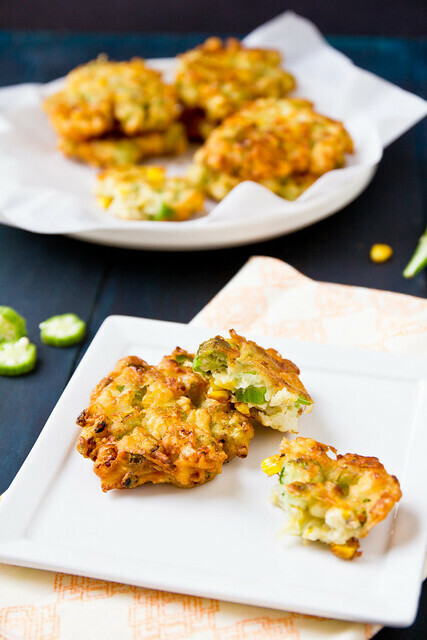 Okra fritters get a summer makeover with grilled corn kernels and tangy goat cheese. Heat ~1/2 inch of vegetable oil in a medium frying pan. In a mixing bowl, combine okra, corn kernels, goat cheese, salt, and pepper, stirring to mix well. Whisk together egg and buttermilk and add to the mixing bowl, mixing until there are no streaks of dry flour left. When the oil is hot enough (a pinch of batter dropped into the oil should vigorously bubble), drop batter by 2 Tbsp and flatten with the back of your spoon. Fry in 2-3 batches, cooking 2-3 minutes on each side, until golden brown. Remove to a paper towel-lined plate to drain and cool. Serve warm. With ranch dressing. Really looks good man ! love it will try to make it one of this day . OOOO! Hello! I just groaned out loud when I saw these. I’ve been meaning to try okra. It doesn’t seem like there could even possibly be any better way than this! I have never tried okra before, this recipe seems like a good one to start with. I’ve never had okra but something tells me this is the way to go if I’m going to take the plunge! Love this pic! Ooooh I LOVE okra! And goat cheese! And summer corn! These are complete and total summer perfection! Dangit, a NEW way to fry okra?! This looks & sounds DIVINE. Oh man, these sound awesome! If only I could get okra up here–I haven’t had it in YEARS! I first read these as “Oak Fritters” and thought, “Shawnda thinks of everything!” lol! Glad to see that they are OKRA fritters instead, though! They look marvelous. Such an awesome southern treat 🙂 love it! these look awesome. I will definitely try these. i love fritters and okra. Ooh I love okra but I rarely eat it. I don’t know why, but I just don’t buy it usually. 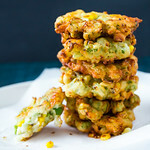 These fritters look so good, I’ll have to finally get some okra and try it! As long as there’s goat cheese, I’m in! Oh man! It’s entirely possible these will get new re-proposed to after 5 1/2 years of marriage! I am SUCH a big fan of okra even though I wasn’t southern-raised. These fritters look fabulous! This sounds super awesome! Love it! I loooove fried okra. I must try this!! I’m not an okra fan, but these look good enough to eat!! These are the epitome of a southern dish! Loving this!! Ohhhh man. I need these ASAP. You are a genius. Excuse me while I wipe the drool from my mouth and computer….These looks wonderful! Can’t wait to try them. You should be able to use just about anything you can grate or crumble. I grew up on okra and yellow squash tossed with salt and pepper, coated in flour and fried. YUM! Your recipe is a for sure keeper.